We bought our Washer from Home Depot several years ago. It is a GE 3.2 cu.ft. Super Plus Capacity washer. It was not the least expensive but a good middle of the road one. It has performed great in the years I have had it. The super plus capacity does hold a lot but it will comfortably hold 5 pairs of men's jeans. It can even do 6 but that's pushing it. The cycles are great. There are not too many and just enough. Really how many cycles does the average person need. One for regular washing, one for really heavy soiled clothing and maybe one for delicates. There are so many washers out there that offer all these neat features that go wasted. Just stick with a more basic unit that holds enough but still gets the job done. This unit has a low, medium and large water fill selection. I have noticed that if I out mine on the low for really small loads that it start to leak from the bottom and not sure why. We have looked for the possible reason but cannot come up with one. I just leave it on medium or large and it's fine. The delicate cycle is great for a women's delicate attire or even for items that say dry clean only. My goodness who actually goes to the dry cleaners anymore. The agitator does not beat the clothes up on this cycle. I do 9 loads of laundry on laundry day. This washer keeps up with me and is still kicking after 7 years. by: used to love GE now I hate it! Wont spin or agitate. I rest it at least once a week and have to change the fuse once a month! It isnt that cheap for a fuse! Im thinking of buying a wash board and a bucket next it would make my life alot easier!!! Will never purchase GE products again. this thing is crap crap, they had to fix it 4 times from the time we bought it. is there any was to reset it after it stops spining, and back and forth. WE have had this washer for over a year and had nothing but problems from day one. It makes this horrible grinding noise and no matter what we do, nothing fixes it. Costumer server was horrible, don't even try to contact them. DO NOT BUY THIS PEACE OF CRAP!!!!!. What a waste of my hard earned money. no spin and agitate after 3 year use,only use once everyweek, Do NOT BUY!! 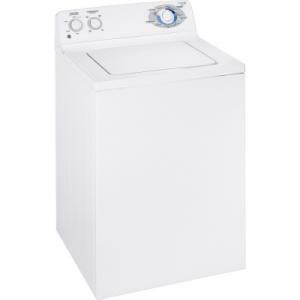 I also have a GE top loading washer (model WHDRR418GOWW). After 13 months, it needed a new transmission. After MUCH pleading with GE, they fixed it for free. Now I've had it 3 years and I constantly need to reset the motor (see above for how to reset). My previous Kenmore washer lasted 15 years. I'll never buy another GE washer. The electrical reset worked for me. My two year-old washer would not agitate or spin. The reset worked on the second try (unplug/plug in/open close lit six times within twelve seconds in the first thirty seconds after it's plugged in). Well, after one year's noisy use, this machine went belly-up. Guess I'll cross GE off my list. My last machine, a Maytag, lasted 28 years. I guess GE stands for "Good Enough"
Stopped spinning again, Sears came out and said the fuse was blown and the motor was bad. Its $572 to fix (he was on tech support for 20 min) What?? I can buy it new for under $400 at Home Depot. Out of warranty and out of patience. GE, if it was a car part it would be a massive recall. Sorry I''m going with another brand.. The washer works well, but the motor died just after a year. (Out of Warranty) The repair man tried to order a new motor but it was on back order (Lots of broken machines? )He said we should plead our case to GE. We called GE and explained that we use it less than before because the kids are grown and it's just the two of us now. They sent us a free new motor, but we still had to pay the repairman. Very annoying. No problems since then. GE top load wash machine is junk!! Have you tried doing the motor reset? If you have a PowerWave you may need to reset the motor. 1. Unplug the washer, wait 1 minute. 2. Plug the washing in. 3. Within 30 secs of plugging back in, lift and close your lid 6 times within 12 seconds. You only have to lift about 3 inches. 4. Reset your water level to small, so as not to waste water and run a cycle. Hopefully this works. Supposedly if there are spikes, etc. you motor "trips" itself and you have to reset. It didn't work for me, about to walk out the door and pick up a new motor. I found these instructions on the GE webpage under support. There are videos, etc. for different things. Turned it on, water filled, and there it sits. No agitation or spin. Pump and timer work, but no main motor action. Trying to find out what ails it, but that isn't necessarily easy. Just ordered a GE Repair manual. Thought the trouble was that magnetic lid switch but put a large magnet on top and nothing changed. May still be it or a relay. Up until yesterday-OK. Today not so good. 2 1/2 years old. Had Washer about 2 yrs and am very pleased. quiet operation, spin drys clothes unbelieveably well. Well, got it on 11/7/2008, today is 6/27/2010 and it is not agitating or spinning. Seems similar to what the others have mentioned, I am going to see if I can get it going, if I do, I post again. Had this washer about a year but hardly used because it is at our 2nd home that we have been to about 10 times maybe since we've had it. Well it no longer works, fills with water but does not agitate or spin. Called a repair man and he said GE appliances are crap. It cost almost as much to fix it as what it cost. Will never buy another GE appliance and telling everyone I can not to! Worked great up until the knob stop spinning. First it was hard to turn, then it wouldn't turn at all. Took the knob off and what do you know? Cheap plastic parts. Even the clip that holds the knob on is plastic. What junk. It only lasted 26 months. I have had this washer less than two years and it is nothing but trouble. When the water fills up it does not want to stop. It flooded my laundry room. It even overfills when it is on a small load. If I could take a 2x4 and just pound on it till I get all of my anger and frustration out I would. This washer has just been nothing but trouble. Nothings but problems! Broke after 12 months and then again 10 months later. Had for less than 2 years and is done. Repairman told me to get a new one, because with all the parts and labor I was going to be over $200.